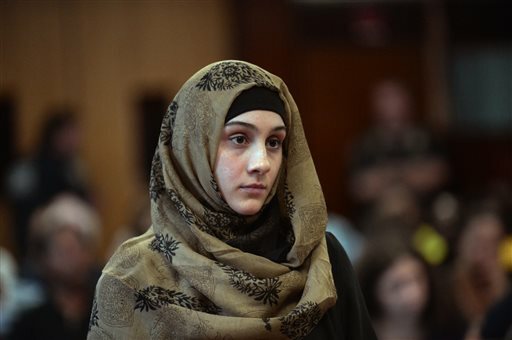 Ailina Tsarnaeva, 24, who lives in North Bergen, New Jersey, is accused of threatening to bomb a woman who previously had a romantic relationship with her husband. Prosecutors said Tsarnaeva had driven past the woman’s house since an order of protection was issued. Tsarnaeva’s attorney, Susan Marcus, said her woman disputes making such statements. Marcus said Tsarnaeva, a mother of two including a 5-month-old, and her family had “absolutely no means,” and she did not deserve to be jailed. Judge Denise Dominquez renewed the order of protection and set bail at $5,000. Tsarnaeva arrived at Manhattan criminal court with a man, though it wasn’t clear if it was her husband, as a small group of protesters screamed insults and a throng of media snapped photographs. “I have nothing to say,” she told reporters. Her lawyer referred to the father of Tsarnaeva’s children as her husband, though it has also been reported they were not married. Tsarnaeva has an ongoing case in Massachusetts and is required to check in with probation officers since prosecutors said she failed to cooperate with a 2010 counterfeiting investigation. She also was arrested in 2009 on charges she left the scene of an accident, but the case was dismissed, prosecutors said. Dzhokhar Tsarnaev is charged with building and planting the two pressure cooker bombs that exploded near the marathon’s finish line, killing three people and injuring more than 260 others. He has pleaded not guilty. Tamerlan Tsarnaev died after a gunbattle with police.